We provide air conditioner installation services for new home construction in the Denver area. If you are building a new home in the Denver, North Carolina area, you have a lot of things you need to make decisions about. One of those is air conditioner installation. Not only do you need to be sure you get the right system for your home, but it also needs to be installed properly for you to get the full spectrum of benefits that the manufacturer is claiming. In order to get the results you want, call us at Cool Comfort Heating & Air. We can work with any builder in the Denver area to do your air conditioner installation to meet code regulations, as well as your specific requirements. Speaking of code regulations, keep in mind that the authorities may set minimums for air conditioner installation, but you are not held to staying at this minimal level. There are often great reasons to go with at least a slightly higher-rated system than they call for. You can gain additional energy savings for one thing. Also, by going with a better system in the beginning, if you later change your home in some way, you may not need to upgrade the HVAC system to accommodate it. We will always give you all the options, so you can decide if you want to go with a sufficient system or one that exceeds the minimum standard. 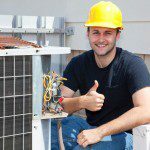 We have performed air conditioner installation and other HVAC services for more than 20 years, and our owner was in the industry 15 years before starting the company. With this much experience, we have seen a thing or two about what works and what doesn’t. We learn what doesn’t by being called to do repairs on relatively new systems. We use that knowledge and experience to give you the best air conditioner installation possible. Contact us today to get a quote or to answer any questions you may have. At Cool Comfort Heating & Air, we provide high-quality air conditioner installation services in Mooresville, Lake Norman, Huntersville, Cornelius, Denver, Troutman, and Davidson, North Carolina.